Chennai: Global Tamil Forum spokesperson and its director of strategic initiatives, Suren Surendiran, presently in Chennai on a private visit, speaks about the Sri Lankan Tamils gaining new hope from change of regime in Delhi. Q: The TNA recently met Indian PM Narendra Modi. How do you view this development? 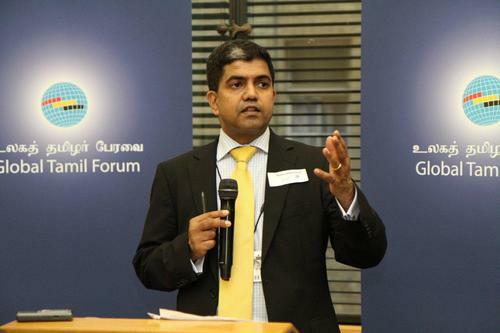 Suren Surendiran: Global Tamil Forum (GTF) believes that Mr Modi meeting TNA members, who are the democratically elected representatives of Tamils in Sri Lanka, is a significant step. On the day after his taking charge as PM, Mr Modi had met President Rajapaksa, who was an invited guest at his inauguration event. However, before meeting a formal Sri Lanka’s government delegation or the official opposition party in Sri Lankan Parliament, PM Modi choosing to meet the TNA underscores the significance. Regarding subsequent events, Rajapaksa has maintained status quo. He has not made any efforts to engage the TNA in any constructive way. The large military presence still continues in the Tamil-dominated north and east. Land-grabbing and government-sponsored colonisation of the Tamil areas with the clear intent to change the demography is still continuing. Vulnerable women, mostly the 80,000 or more Tamil war widows in the north and east, are being harassed and subjected to sexual violence, largely by the Sinhala military. Q: What will the efforts towards success in the Sri Lankan Tamil issue look like, say about 18 months from now? And what would be the impact if these efforts fail to yield fruit? Suren: The Indian foreign policy towards Sri Lanka corrects its course and takes more of a regional leadership role than being the subdued equal partner role. In this process, India uses all levers at her disposal with specific timelines set to achieve lasting peace in the region. India and the international community maintain pressure on Rajapaksa to deliver on his promises and articulate consequences for non-delivery. Tamil leadership in the north/east and around the country, including the plantation workers and the leadership of the Tamil-speaking Muslims should find convergence on the important issues faced by their communities. The same should be achieved with the like-minded Sinhala Buddhists and Christians. While Tamil diaspora is accepted as a stakeholder by most of the international community, India’s recognition will be fundamentally important to strengthen the moderate voices within the diaspora. This, in turn, will broaden the stakeholder base that can add capacity and capability to the struggle, in the most constructive way. Failure would mean that Rajapaksa continues as the hawkish President with a corrupt regime persecuting minorities. Allowing this would create rebellious forces from several communities and that will not just destabilise Sri Lanka but the entire region. Q: LTTE chief Velupillai Prabhakaran was the sole voice representing the Tamil people of Sri Lanka until his death in May 2009. Now the Tamil voice not only sounds weak but also is badly divided. Suren: The TNA, the elected representatives of the Tamil people in the island, and the GTF that is an umbrella body in the diaspora with significant influence and contacts with several international bodies and governments, work in conjunction. There has been a programme run by the several representative bodies to consolidate even further, which work is in progress. TNA has also taken steps to explore possibilities of convergence with the leadership of Tamil-speaking Muslims in the island. I am more positive about my community than less! Q: Should the Tamils continue to insist on separate Eelam or work towards something that might be more realistic in achieving, such as the 13thAmendment as a starting point? Suren: GTF is committed to non-violence. We seek lasting peace in Sri Lanka, based on justice, reconciliation and negotiated political settlement within an undivided island of Sri Lanka. Q: Considering the Chinese interest and involvement in Sri Lanka, what, according to you, should be the Indian agenda in the strategically important southern neighbour? Suren: India should at least now, take a regional leadership role to assert her policy on strategic and national security priorities. The lack of it may leave India a larger and unnecessarily wider issue to deal with in the near future.